Karma was spread in more ways than one earlier this month, as our friends at Karma House helped us to put the finishing touches to Apuan Elementary’s library. 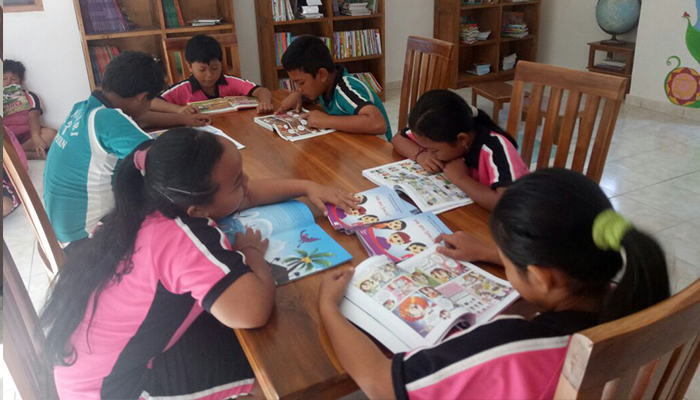 Apuan Elementary had been on our libraries waiting list for quite some time. 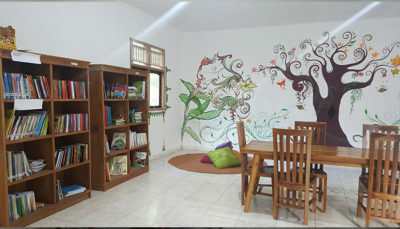 The school had a very good building and space for their library. 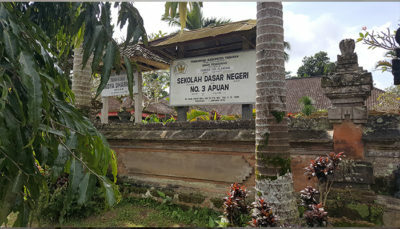 However, as with many schools, Apuan had hardly any books. The books they had were over 10 years old and completely inappropriate for students. With a lack of books and support came a lack of inspiration. Children did not want to read old books in a room that wasn’t inspiring. The murky yellow walls, coupled with old furniture and nowhere to sit explains why the original library had not worked. 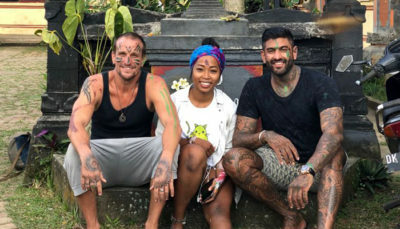 Bali Children’s Project knew how to help Apuan. The building was structurally in good shape, along with some great teachers, keen to improve their school. It would take new books, furniture and a lick of paint to complete the library. Following two separate donations of books and supplies from supporters Bridget and Monica, we had managed to equip the library. However something was missing. The problem was in the room. Literally. We had given some cushions and rugs, but still the room had little life to it. The dark yellow walls just weren’t inspiring and we were missing a reading table. When we met our friends at Karma House – a community of tattoo artists in Penestanan, Ubud, they instantly volunteered to help with Apuan’s issues. Mobilising their team of artists, Karma House donated to buy a new table and chair set – but that wasn’t all they had up their ‘sleeve’. 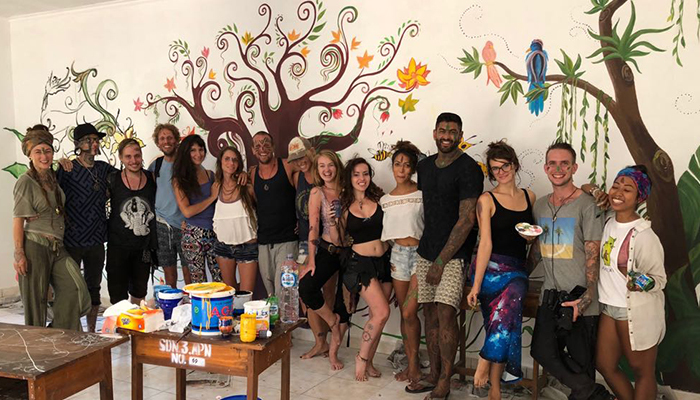 Karma got together their artistic talents and helped to breathe a new life into Apuan’s library, through new mural paintings. 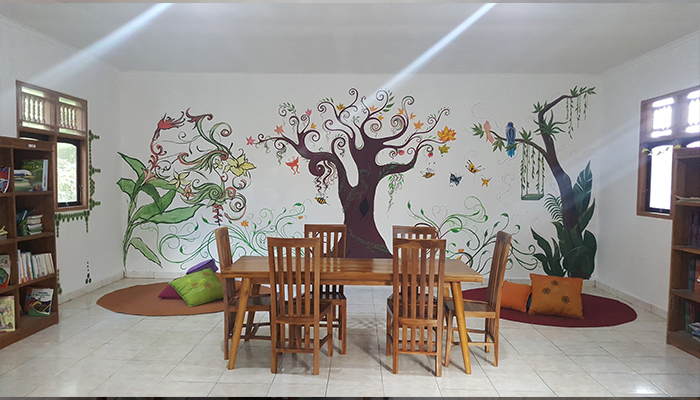 As you can see from the before and after photos, the library transformed from a dark yellow formality to a forest scene bursting with life. The mural was the final touch on a project that only happened thanks to several generous people from around the world donating to help the library. 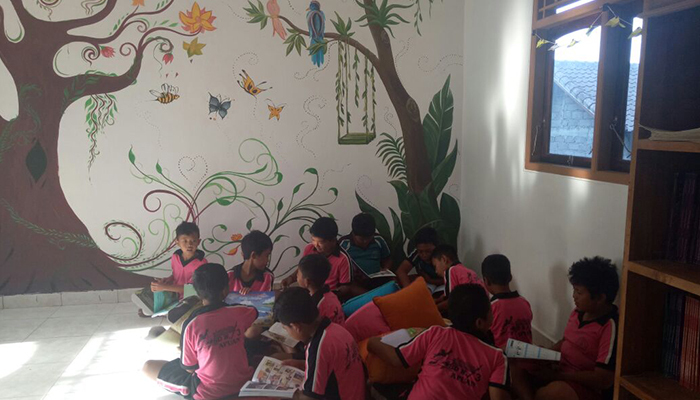 Transforming libraries is part of Bali Children’s Project’s main goals. 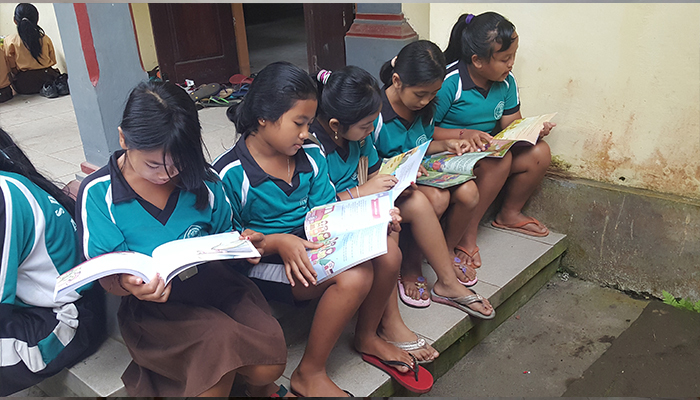 Most children in Bali not owning a book, and so reading and literacy suffer. 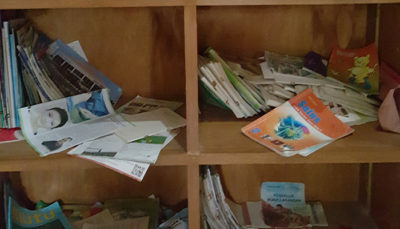 With libraries often operating from poor quality buildings with limited and old books, it’s no wonder that children don’t go out of their way to read in school. This is slowly changing thanks to kind people like Karma House, who are helping us to give old libraries new leases of life. We are proud to say that the Apuan Project is now 100% complete! 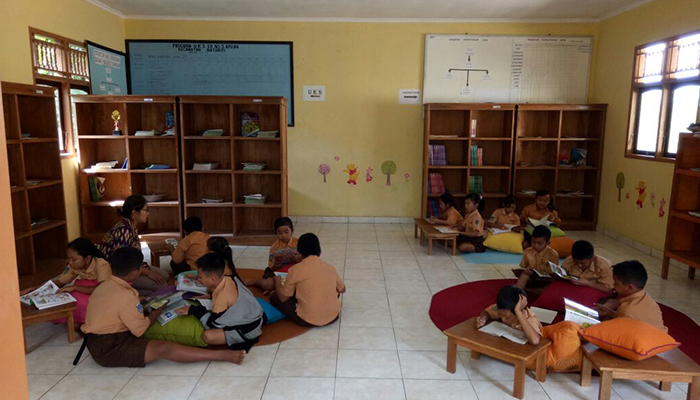 There are many more libraries in Bali needing help. If you can donate books or help us renovate, please get in touch.